December is the last month of the year and the first month of winter! And whether you&apos;re leaving town for the holidays, or staying home and being festive, this month&apos;s edition of Living Wise has something in it for YOU! Along with tips for "out of towners", we&apos;d like to remind you that we do have the Guest Suite available for your out of town guests! Ask our Property Manager, Kathi for details! We also are holding another contest! This one is "Deck Your Hallway" (doorway, actually) and like we&apos;ve done in the past, we are asking you to post a photo of your holiday decorations (hallway, doorway, balcony, coffee table, etc). Beginning Monday, December 4th, post your most creative or loud or traditional holiday decorations to our Facebook page, @HaymeadowApts. You could win one of 3 prizes!! Contest ends on Sunday, Decemeber 17th. Happy Holidays, to the best residents in Peoria! We hope it is filled with love and laughter. 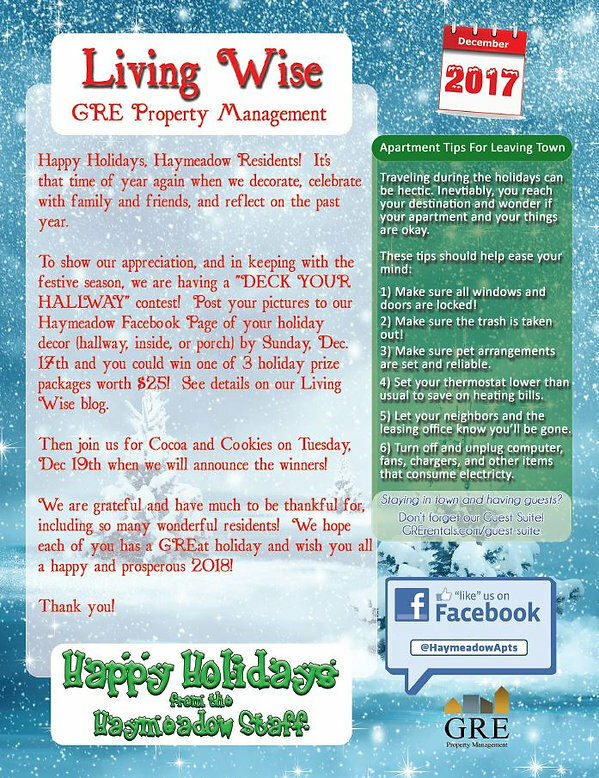 Thank you for reading, don&apos;t forget to follow us on Facebook @GRErentals and @HaymeadowApts.